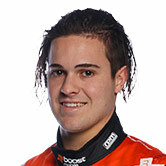 Garry Rogers Motorsport young gun James Golding has taken first blood in round five of the Supercars Dunlop Series at the Wilson Security Sandown 500. Golding topped the timesheets in first practice at the south-east Melbourne circuit today, in a time of 1:10.8102 seconds, besting Championship leader Jack Le Brocq by only one-hundredth of a second. ISeek Racing’s Todd Hazelwood ended the session in third place, a half second further back. Several Dunlop Series drivers are doing ‘double duties’ as co-drivers in the ‘main-game’ as well, with Golding, Le Brocq, Paul Dumbrell, Shae Davies, Andrew Jones and Macauley Jones all driving in both categories this weekend. Their first session was held in difficult conditions, with plenty of overnight rain meaning all grassed areas were treacherously wet and slippery. The high speed turn one entry caught plenty of runners out, with 16-year-old Alex Rullo the first, running wide at turn one into the grass to get bogged in the mud and slush. He triggered the first red flag only eight minutes into the session. Championship contender Garry Jacobson – one of the few top Dunlop Series drivers to not be running in both series this weekend – also ran off at turn one, but slid through to the chicane and was able to continue unabated. Young Liam McAdam was another who took to the grass at turn one in his Eggleston Motorsport Commodore, but allowed momentum to carry him back onto the circuit. Adam Marjoram also took an off-track excursion at Dandenong Road at over 230km/h, but was lucky enough to recover and rejoin the circuit without damage or penalty. The end of the session was a shootout for fast times, with Golding, Jack Le Brocq and Hazelwood trading quick times across the final ten minutes. Returning racer Chelsea Angelo spent the session finding her feet in the Matt White Motorsport Falcon, with a solid 1:13.075 for p21. The second Dunlop Series practice session starts at 2:45pm local time.